"We are optimistic about the development of the Greek insurance market, in recent years taking important steps for its progress: local insurers are much more capitalized, and they made serious reforms concerning corporate governance and transparency. In addition, we have a strong supervisor, the Bank of Greece, and a strict pan-European institutional framework - Solvency II", said Alexandros SARRIGEORGIOU, Chairman of the Board of Directors of the Hellenic Association of Insurance Companies. In terms of GWP, the life insurance segment was down by 0.50% y-o-y to EUR 1.86 billion due the 6.6% decrease reported by traditional policies to EUR 1.27 billion. Non-life insurance GWP accounted for 52.4% of the total - EUR 2.05 billion, or 4.0% more y-o-y. "The insurance market is closely linked to the economy. At the same time is one of the largest institutional investors in the country. The insurance market is a powerful lever for growth. We are ready to work with local insurer to provide the most suitable solutions to citizens - on serious issues such as pensions, health and natural disasters". 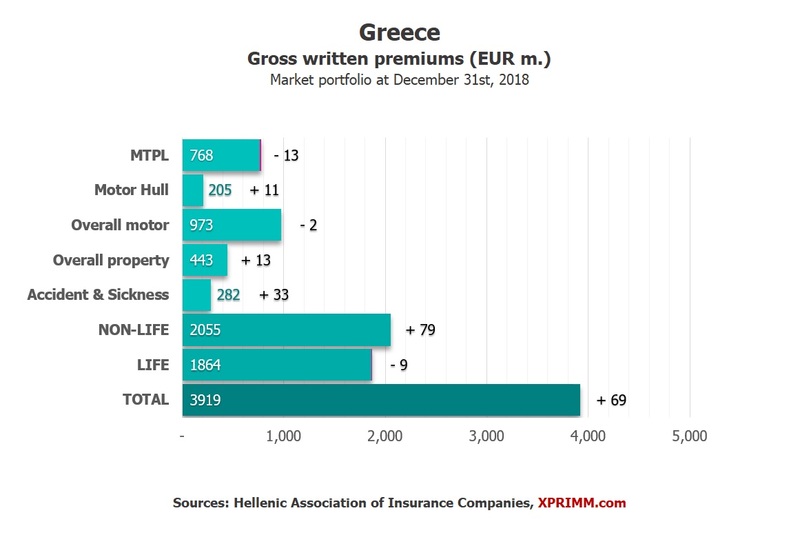 Access www.xprimm.com and download FY2018 Greece insurance market statistics.